Other reports of when global warning was clear date to 1958 or 1959. Look at the graph at the top of the post. 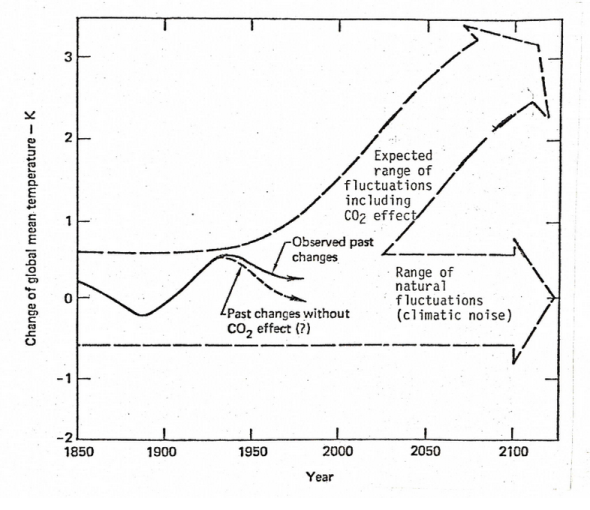 This is a graph from the now famous Exxon documents that date to 1981, explaining how Exxon scientists were projecting global warming with continued release of the greenhouse gas CO2 into the atmosphere…. There are several interesting things about this graph. First, it was made in the 1980s, which proves that an IBM Selectric can make graphs. But never mind that. The graph shows the range of global surface temperature (vertical axis) over time (horizontal axis) in the past and future. If there was no effect from the human generated greenhouse gas CO2, global surface temperature would range, and had previously ranged, between about a half a degree C (Kelvin in the graph, but one degree K is one degree C) above and below a hypothetical baseline. However, given the influence of human generated greenhouse gas, the temperature rises. …Exxon 1981 had it right. The revelations of the Exxon research, and the fact that it was kept secret and all that, is an interesting story. And, that story will develop over coming days, week, and months. But I don’t want to lose track of the other story, in some ways even more interesting. How surprised should we be, after all, that a major corporation would both look into and ignore, possibly even repress, the science associated with their primary activity? Not at all, really. But what is surprising is that we (and by “we” I mean scientists who have studied climate change) have understood the basic problem for a very long time, and decades of research have confirmed early findings, and of course, added important details. So like Big Tobacco, Big Oil has known for decades that it was selling us a product that was killing us, and not only kept selling it, but did all it could to lie and deny. As I said at the start of the post I guess its not really surprising. But it is completely and utterly depressing none the less. Yup, these corporate criminals run the world. These people a serious about the criminality argument. We’ll be seeing more of this in the near future. John Key is still peddling his mischief about not being sued under the TPP. Mischief because so far we haven’t had FTA with countries that have a penchant for suing governments… The TPP would, however, expose us to them. As was pointed out this morning, if Key is so confidant we can’t/won’t be sued under TPP why has he stalled on the tobacco packaging legislation? Exxon-Mobil did put $600mill into algae research with a genomics firm from 2009. This is one of the more productive ways of generating biofuel, but even then, the scale required is still immense. Exxon seem to be interested in the long-term commercial benefits of this work, leaning towards holding IP rights from 2013. The difficult fact remains that there is an awful lot of energy in a litre of petrol. It’ll be hard to replace on a renewable, zero carbon basis. I liked the Shells scenarios better. They forecast kinds of world order, not just one input. I posted this the other day but it bears repeating. It’s a native woman from Canada speaking truth to some oil robbers and refusing them access onto traditional lands. It’s worth watching to see the huge gulf between the life-affirming humans and the death cult ones. The woman is awesome, real. The oil guys are weird and shifty but mostly they’re just incredibly disconnected from reality. I think a couple of things watching this. One is that the indigenous peoples are already putting their lives on the line. Not literally in terms of death, but literally in terms of putting their bodies in front of the machines and making this a priority. This is where we all need to go now. Be willing to give up aspects of our personal lives and put a stop to what is happening. After reading the post, the other thing that comes to mind is that the sociopaths are going to become more and more apparent for what they are and we need a strategy for dealing with them. Yes, the greenhouse effect was certainly known to science teachers in Otago early in 1970’s from memory. Some of us immediately began writing and testing teaching units and spreading awareness at that time, which is why I’ve despaired of sluggish uptake to approved curriculum and so of general awareness. An old saying once in vogue was that it took a hundred years between the pulpit and the pew. Did you drive your car to work today? And for all those other occasions when I did have to use my car (that uses 5.1 l/100k typically) – I will be very happy to choose a better alternative when it becomes available. Although in general your point is correct – personal responsibility and example is important. I did drive today, usually I walk. Had it not been for Exxon and the other deniers the vehicle I drove would probably (like the vast majority of vehicles) have been electric. As it is, at least I’ll make sure that my next one is. Happy to support climate criminals ? So, you would be in favour of legislation making it illegal to own cars? Confused desperate distraction and blame shifting. Now we know the Fossil Fuel industry is behaving like what the Tobacco industry did and still does we have to call them out on their propaganda. The CEO of Exxon Mobil is also trying to stop any Fracking within 250 miles of his Ranch. And one might also speculate that not only did Exxon spend a decade researching AGW – so that they might fully understand the implications – they subsequently exploited the known uncertainties in the science at the time to generate the the vast edifice of misinformation that stands to this day. Even Margaret Thatcher knew the AGW was real, but at some point the political right collectively determined to lie about it. A deliberate, conscious and cold blooded lie whose sole purpose was to protect their wealth and privilege. There will be consequences. Personal responsibility as it were. This proves, beyond doubt, that the science and economy shouldn’t be left to the corporations. They’ll lie and deceive so that they can continue making a profit even if that profit will kill us and them. Reality once again proves the neo-liberal mantra wrong. I will believe corporations are entitled to the same rights as individuals when Texas executes one. Exxon would be a good start. IT was unstoppable CO2 wise around 1960, but it has been set in stone since the global population went exponential – 1800 ish? Exxon et al are no different than any other group of humans, from midwives to primary school teachers to prim ministers they/we believed the BS that we can just keep on growing ie Kiwi Saver. It’s the everyone wants a flat screen TV, 2 Cars in the garage, and all being doctors, society we live in. Equal rights, everyone living in a warm damp free house, full employment, friendly law and order, cradle to the grave medical cover, it is all part of the BS that has driven us off the cliff. We have committed infanticide, alas we are here to witness it. NZ 2.4 million, 1/4 acre Auckland available. ► 50% of Europe’s “Renewable Energy” comes from burning wood imported from all around the world from assorted lumber mafias, including Russia. ► Europe burns palm and soy oils in their German diesel cars and lies about the emissions. Indonesia kills elephants and orangutans to clear cut forests to grow palm oil plantations. Both lumber and palm oil are exported to Europe for burning. ► Europe’s emissions trading scheme is so riddled with loopholes that it actually pays large polluters to pollute more. ► It takes 10 times the rated intermittent energy to displace one fossil fuel plant. This means Germany has to strip mine Lignite which is the dirtiest coal in the world. In fact, they are relocating whole villages to expand their open pit mining operations. ► There are not enough resources on earth to provide several billion people with renewable energy. ► The British Foreign Office predicts civilization’s collapse by 2040 because drought and global heating reinforce each other. From 1948-1970, 10% of earth was in drought. That figure is now 20%.